The Mack Motor-Home : The Story So Far. Mack Fire Truck Motor Home. ____ Here is a link to a video I made of the truck while out on a camping trip at Bird's Hill Provincial Park in Manitoba, Canada......Click on the link to watch. ____ Two loads of peat-moss to Laredo with my long-time buddy from Sunderland taking the other one. But he has already gone when I get to the yard. I am an hour behind him all the way to Vermillion, South Dakota. When I arrive it is almost mid-night; a ten hour break and I'm back behind the wheel heading for the Cowboy Travel Plaza at Orlando in Oklahoma. The Mackem is already there; we go and have a bar-b-q meal in the Hokey-Pokey Restaurant where he tells me that his idea of "Running-Together" is to meet up for a meal every evening while doing your own thing during the day. Suits me; we both know the route well enough. Third night-out is at Pearsall, a hundred miles north of Laredo. ____ Friday morning and I'm up and away early; first into the yard at the delivery address after overtaking a third Ruby truck at the last set of lights. First unloaded and away across Laredo for a trailer switch; a bonded load from Mexico, going to Calgary, Alberta. Twenty-five thousand pounds of cargo while the Mackem phones to say he has 44,000 lbs of fruit juice, also, going to Calgary. We arrange to meet at Cooper's BBQ Restaurant, at the junction of Interstate 10 and US Highway 83, in the town called Junction. ____ The food is good although an extra rib and an extra slice of brisket would have made it prefect. We sit under an old oak tree, beside the six barbeque pits and watch the world roll by as hordes of feral cats come creeping around as dusk descends. Back at the trucks; we have two oversize loads as neighbours. Lonny and Brad hauling roof-top air-conditioners from California to Houston on double-drop low-loaders. They have a barbeque set up on the back of a trailer and a case of ice cold Budweiser. They call us over for a beer and a chat. Brad has his girlfriend, Heather, with him and is in his element; holding court and telling stories while the rest of us make half-hearted attempts to catch the cutest feral kitten for Heather. ____ Another three long days are needed to get to Calgary for Tuesday morning. The evening meals are at Hickory House, Lamar, Colarado, and the Country Kitchen at Sheridan in Wyoming before the A and W burger bar at Vulcan, just south of Calgary. Another trailer switch and I am heading East; to Saskatchewan but also straight into a police speed-trap. An oasis of 80 kph in the desert of 100 kph where the Stoney Trail joins the Highway X22. A money-maker for the police and it is easy to see why so many drivers despise the tactics of law enforcement officers. One hundred in an eighty limit and a $160 fine; an occupational hazard. Hookers and truckers: the only two professions that go to work knowing that they will get fucked. ____ Just a few miles along the X22 is a huge billboard on First-Nation land warning about the dangers of crystal-meth; such irony. Why don't the police show such dedication to catching drug-dealers as they do for catching speeding drivers? Then maybe such vast tracts of North American society would not consider them as the enemy? On to Moose Jaw for the night before loading salt at Belle Plaine; then back to Steinbach to complete the triangle. Three Ruby Truckline on the bank at Laredo, Texas. Harvest is nearly over for another year. Yellow truck with yellow log shifter. 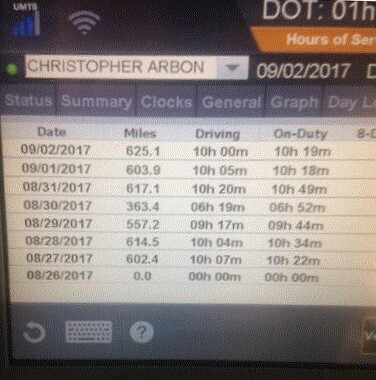 First six days mileage and hours. Drilling rig on 11 axle heavy-hauler. 9753 Kilometres in 13 Days. ____ My usual routine of Tuesday departures and deliveries on a Friday in Southern Texas was broken by my attendance at a wedding. I had the whole week off and a very good choice it turned out to be. Hurricane Harvey came ashore just when I normally be unloading and going for a reload. I left Sunday morning with television pictures showing floods and destruction. Nights-out on the way down at Norfolk, Nebraska and Thackerville, Oklahoma. Then down to Edinburg, Texas, close to Donna and south of the disaster area. ____ It was only after I was unloaded and on my way to Waller that I encountered Harvey's damage. Miles of power-lines with broken poles. Billboards ripped to shreds and then in the town of Refugio, I came across a town of roof-less homes and shattered businesses. From there to Waller, the carnage continued with detours to avoid flooded roads and fallen power lines. The factory at Waller was closed due to a power-cut but re-opened on the Thursday morning and I did the trailer switch before setting-off for Burnaby in British Columbia. ____ To Amarillo, followed by Monticello in Utah and on to Boise, Idaho, before the weekly driving hours were exhausted. 3983 miles in sixty-six and a quarter hours driving with just an hour of duty time left from the seventy; an average of just over 60 mph. Thirty-six hours of relaxation at the Boise TA; just over the road from the Flying J and a big retail park. It was the Labor Day Long Weekend in both the US and Canada so it didn't matter that I arrived in Burnaby on Tuesday morning after battling with the holiday traffic on a long hot Holiday Monday in Washington State. ____ The next leg of the trip was an empty run up the Coquihalla pass and across to Kelowna. If that was easy going then the 50,000 lbs of fruit juice put a stop to any flying-about on the Rocky Mountain crossing to Alberta and then onto Saskatoon, in Saskatchewan. Plenty of time to meet the Friday morning delivery appointment but fuel consumption rocketed. The office couldn't find a reload for the Manitoba region so I ran back empty to Steinbach; getting home just before mid-night. Devastated Shell station in Refugio, Texas. On the way to Albuquerque. Heavy-haul load waiting for Houston floods to subside.